I can’t even follow my own recipes. 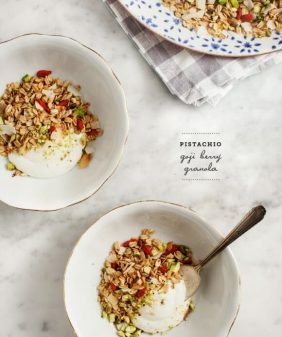 I set out to remake this pistachio goji granola in bar form (thanks to a reader suggestion). I thought it was a great idea, especially because I’ve been looking for healthy grab-and-go breakfast options for Jack to take to work. I realize this looks more like dessert than breakfast, but I had to come up with something more enticing than the pre-packaged Costco office bagels (he just informed me) he’s been consuming every morning. For the sake of our marriage, I’m not going to get started on why he eats these (how can they even taste good?! )… but I get it, they’re “there”… so in man world that must count for something. But I digress… this week, after trying out multiple variations of baked oaty things, I ended up here… which is in fact not a pistachio goji granola bar, but a peanut buttery oaty nutty rice crispy treat with – yes – chocolate. This might not be a green smoothie but I’m just hoping these will last him til lunch… I (personally) find them to be a nice little late-afternoon snack. Some inspiration taken from Oh She Glows and Sprouted Kitchen. Line a 5x7 rectangle dish with parchment paper and a tiny bit of cooking spray. Place the brown rice cereal into a large bowl and set aside. In a large skillet over low heat, toast the oats, gently stirring so they toast somewhat evenly. Once they're starting to brown around the edges, add the walnuts coconut flakes, salt and cinnamon. Continue to toast until the coconut flakes are slightly toasted. (total toasting time should be about 5-8 minutes. Remove from heat and transfer the toasted mixture into the bowl with the brown rice cereal. Mix and let cool completely. In a small glass bowl mix the coconut oil, brown rice syrup and peanut butter. If your ingredients are too thick to whisk, pop it into the microwave for a few seconds to slightly melt everything. Whisk until creamy. Let cool completely. Pour the peanut butter mixture into the rice cereal/oat mixture and gently fold everything together until it's fully incorporated. Stir in the chocolate chips and press into a 5x7 pan, or equivalent. (Note: it's important not to stir in the chocolate until everything is cooled or the chocolate will melt all over the place. Which tastes just fine, but they won't look the same). Pour the gooey mixture into the prepared pan and let chill in the freezer for about 30 minutes for them to set. After they're set, slice & eat, then store the remainder in the fridge. wow does this ever look good! These look amazing! Do you think maple syrup or coconut nectar would work instead of the brown rice syrup??? Thanks! I’m not sure they would hold together the same way – the brown rice syrup is very sticky (more like honey). So would I be able to use honey instead of brown rice syrup? I can’t seem to find it! I didn’t try it, so I can’t say for sure… if you give it a try, let me know how it goes! so glad, thanks for letting me know! This looks great! 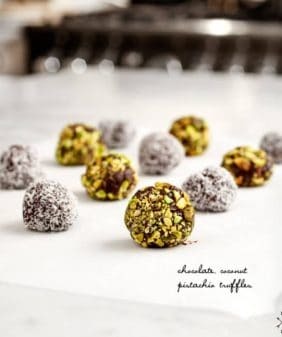 The chocolate chips won’t be optional for me 🙂 I would want a bar of this for breakfast and afternoon snack! 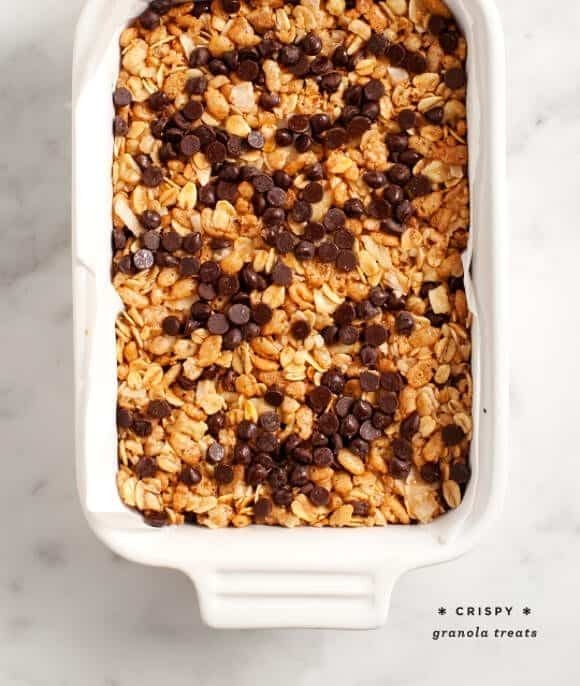 I love that this is dairy-free without the chocolate chips! 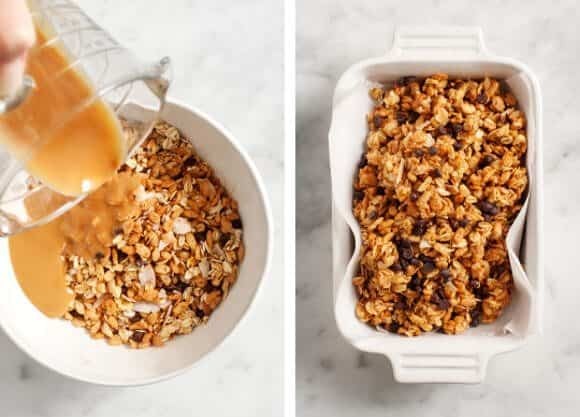 This is perfect for my ultra granola loving friends! I could seriously eat stuff like this every day. It’s such a nice sweet treat! Me too – although sort of dangerous to have around, they’re addictive! Well this looks ridiculously tasty! 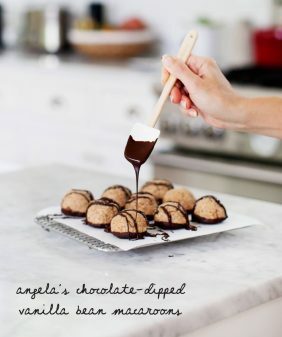 I am setting out to make these right now. Breakfast or dessert I will take them. Hi Emily, hope you like! I like the coconut in this — really good. Bet your hubby is glad you landed with this recipe after your many attempts at “baked oaty things.” Gotta beat that bagel. Thanks for sharing! 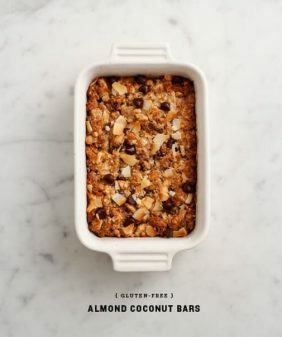 Looks fantastic – do you think it would work with Almond Butter? How is it that every single post I’ve read since I discovered your blog is a jewel?! This looks exactly like the kinda thing I would love 🙂 Oh and I made your sweet potato hummus the other night it was one of the best I’ve ever had, so thank you so much ! Yum, this looks delicious – I have been looking for alternatives to toast with Vegemite this week, this is going on the list! This may be a silly question….what kind of cereal is brown rice cereal? I don’t normally purchase cereals due to gluten. Thanks! like rice crispies, only made with brown rice (and not all of the other awful cereal additives)… I usually get the 365 Whole Foods brand, but there are a few other brands that make the same thing… just read the label to make sure it’s one that was made in a gluten free facility. I’m glad you digressed for what you had originally planned. I would much rather have one of these bars than a green smoothie! I made these are they are amazing! Now I want to make the pistachio goji berry granola in bar form like you mentioned. I will just switch walnuts for pistachios and chocolate chips for goji berries, but if I don’t substitute anything for the peanut butter will the bars stick together? 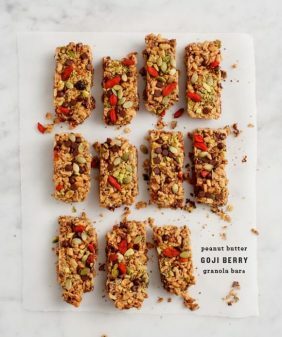 Any suggestions for peanut butter replacements if I am making the goji berry pistachio bars? Hi Tiffany – here’s what I did first that (sort of) worked: To that recipe, I skipped the maple syrup, toasted everything, then (off the heat), stirred in a few tablespoons each of brown rice syrup and peanut butter. I flattened it into a parchment lined dish and baked it until golden brown on top. It held together pretty well but was a little dense… (so many oats! )… which is how I came to add the cereal. I realize this is only a half answer to your question – you’ll have to experiment a little (maybe more brown rice syrup & skip peanut butter… honey might work if you’re not vegan). I’ll report back if I figure out a more exact recipe! My boyfriend is obsessed with bagels too! Must be a guy thing…This looks much tastier- and I’ve just gone gluten free so on the look out for tasty treats I’m allowed! Thanks for the recipe! Just made these and subbed in corn chex for the rice cereal since that’s what we had in the cupboard, and they are delicious! Thanks Jen! I’m so glad you’ve found them to be so versatile with on-hand ingredients! Would an 8×8 pan work? These are gorgeous and delicious! What do you think about mixing it up with some almond butter and sprouted roasted almonds inside? Love this post! I think both of those alterations would be delicious!! 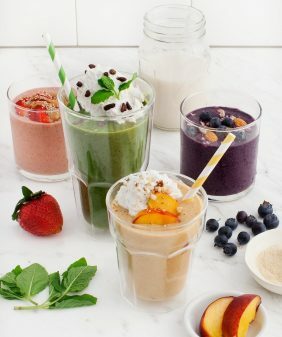 Hi there, these look great and I’d like to make them, but I need to know what kind of oats you used. Quick cooking? Or regular large flake? Thanks.